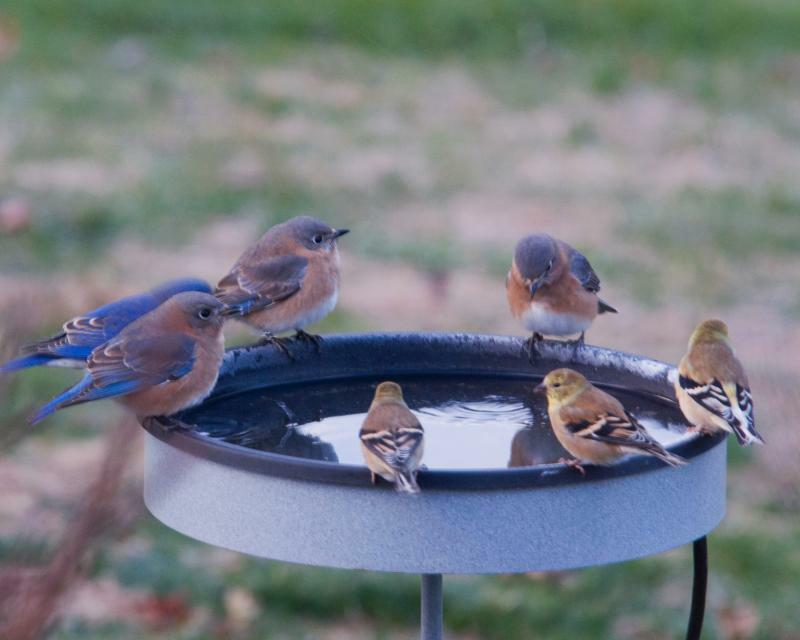 The sound of running water in a birdbath or pond will be heard by migrating birds from a distance and will draw them in for a drink and possibly a quick dip. Don’t take down sugar water feeders as soon as local hummingbirds start leaving in the fall. There are huge numbers of hummingbirds that have spent the summer farther north and migrate through the area and need to recharge themselves at the feeders. Early fall is a good time to clean out and repair bird-houses in preparation for hosting species that roost during fall and winter. The old nests can attract insects and parasites and should be removed before winter residents move in to keep safe and warm. Pile cut and fallen branches and twigs in the corner of the yard to create cover for birds. They use the brush piles for roosting at night and protection from predators. There is no better natural cover for birds in fall and winter than evergreens. Fall is a good time to double the number and kinds of feeders you put out. To attract the greatest number and variety of birds, provide a variety of seed and suet feeders. One of the main reasons for feeding birds is so that you can enjoy watching their behavior in a natural environment. If you move your feeders and birdbaths closer you can get a better look. Many birds that visit your yards will not eat seeds, but they will eat insects and fruits. Offer live mealworms (we sell them by the 1000’s) or chunks of apples, berries and jellies. If you like the sounds of birds chirping and chattering, consider installing a wireless baby monitor outside and send the noise of nature inside to a well-placed receiver. More birds collide with windows in the fall than any other season. Often migrating birds that are not familiar with the terrain see the reflections of the trees and fly right into it. Try to remove or mute the reflections with soap, netting, screening or streamers.